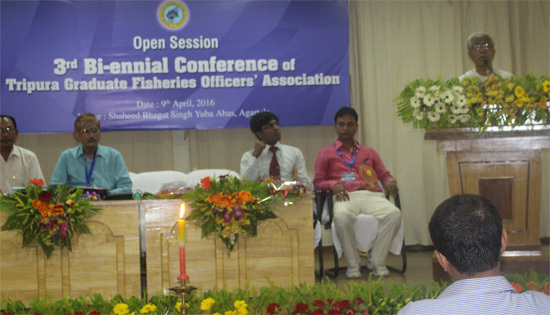 Third biennial conference of the Tripura Graduate Fisheries Officers’ Association (TGFOA) was held at Shahid Bhagat Singh Yaba Abas in Agartala, Tripura, India on 9th and 10th April, 2016. 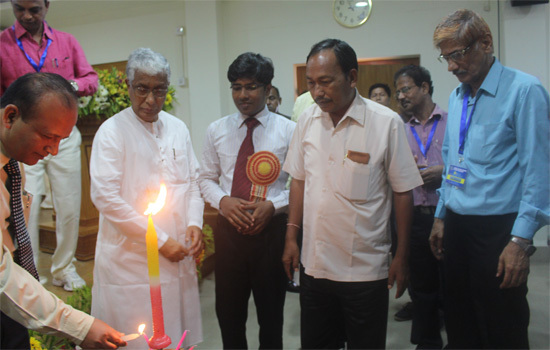 The honorable Chief Minister of Tripura Sri Manik Sarkar graced the occasion as Chief Guest on the first day. Honorable Executive Member of TTAADC Mr Santanu Jamatia; Professor Dr Md Akhtar Hossain and Mr Shams Muhammad Galib from the Department of Fisheries, University of Rajshahi, Bangladesh were also present as Special Guests. In the beginning of the program, inauguration through lighting the lamp took place by the Chief Guest and other dignitaries. Welcome address was given by Mr Gouranga Chandra Sarkar who has highlighted the activities and success of TGFAO including emphasis on state, national and international scenarios in relevant fields. In his speech, honorable Chief Minister Sri Manik Sarkar mentioned the success of his administration in fish production and suggested for finding out the way in meeting up the demand in Tripura. He also addressed issues responsible for achieving the goal of his government in Tripura. The Chief Guest also encouraged TGFOA for their remarkable contributions for the development of fisheries in Tripura and also for inviting foreign professionals in the conference to strengthen the collaboration and for sharing ideas leading to the sustainable development. Retired senior members of the TGFOA were felicitated in the program by the guests. 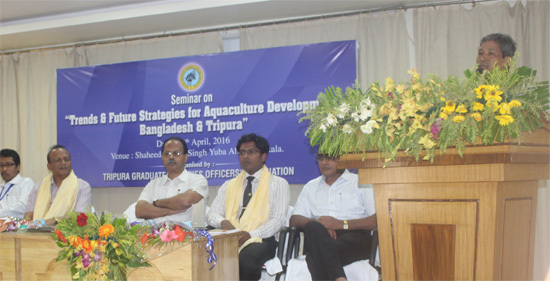 On the second day, a seminar on “Trends and Future Strategies for Aquaculture Development: Bangladesh and Tripura” took place at the same venue where honorable Fisheries Minister of Tripura Government Sri Khagendra Jamatia was present as the Chief Guest. In the technical session, Professor Dr Hossain from Bangladesh nicely presented the trends, advancements and strategies of aquaculture in Bangladesh. Mr Galib, also from Bangladesh, delivered his presentation on aquaculture research of Bangladesh. Professor Dr RK Saha, from the College of Fisheries, Lembucherra and Mr N Majumder, Director of Fisheries, Government of Tripura also gave their presentations on overview of the research activities of the College of Fisheries and present status of Department of Fisheries of Tripura government respectively. After the presentation, a lively panel of discussion took place where presenters answered to the participant’s questions. 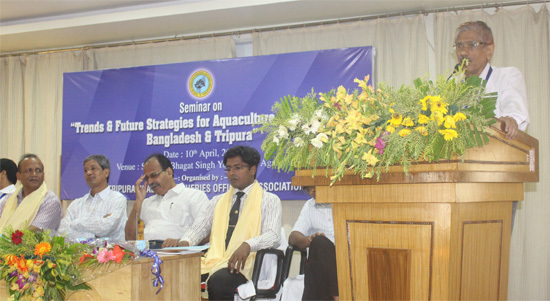 Honorable Minister of Fisheries Sri Khagendra Jamatia, in his speech, expressed his high satisfaction on the program organized by the TGFOA and urged association members to reach the fish production goal by deadline set by the Tripura government. Mr Hirak Sarkar, Publication Secretary of TGFOA, was the facilitator during the session. Mr Alok Kumar Chakraborti, President of TGFOA, thanked all his colleagues and guests for their active collaboration and cooperation and expected further collaboration between India and Bangladesh regarding aquaculture aspects by this conference.